Arrange matches online by challenging others on your ladder or posting your availability to play	on a	designated date/time. Set your own matches at your convenience and play as often as	you want, wherever you want. New computer rankings will be generated each week based on matches played during the week. 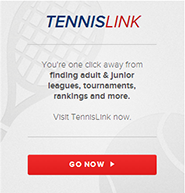 Players can view their updated rankings online each Monday. Registration is a two step process. Create an account by clicking on "Registration/Log-In" on the menu to the left, then click on the "Pay Online" option on the menu to the left. Once your payment is received, your registration will be approved. Awards for the Top Finisher on Each Ladder! For more information click on "Junior Challenge Ladder" on the menu to the left of your screen or contact Brendan O'Connor at bpoc10s@yahoo.com.